Frostad Atelier Foundry opened for business in a white-collar district of Rocklin, California in 1998 by Ronnie Frostad. She had experience managing another foundry in Sacramento and began her own business with one employee. The foundry quickly grew, and after five years she moved to a larger facility at the recently closed McClellan Air Force Base in Sacramento, California. This foundry had previously been used by the United States Air Force for casting parts for its planes, and she modified this foundry for her own bronze work. The McClellan foundry was very large (28 thousand sq. ft) and was equipped with overhead cranes that allowed for the construction of monumental sculptures. The largest standing bronze sculpture in the world was cast and assembled in this facility for its home at Queens University, Charlotte, North Carolina. In 2016 we moved from the McClellan foundry and began construction of a modern, state-of-the-art foundry and fine art gallery within the city limits of Sacramento. This new foundry opened for business in January 2017 and serves artists mainly in the Central area of California, but many of our clients are on the East Coast of the United States. This new location, being close to the Sacramento International Airport and the major freeways of Sacramento, allows for easy access and expedient shipping to and from the foundry. 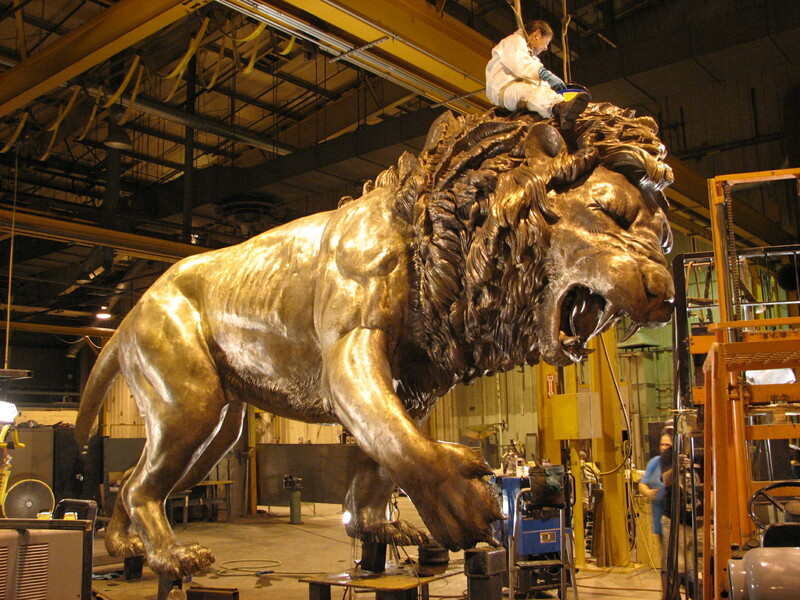 “Roaring Lion”, the largest standing lion in the world, was constructed in our Rocklin Foundry. The lion’s journey across the U.S. was followed by Good Morning America and filmed by the Local TV station as it entered Charlotte, NC. The foundry featured on KCRA TV Sacramento in 2017.